For an area commonly hidden from customers and the rest of the public, a warehouse can prove to be a dangerous place. 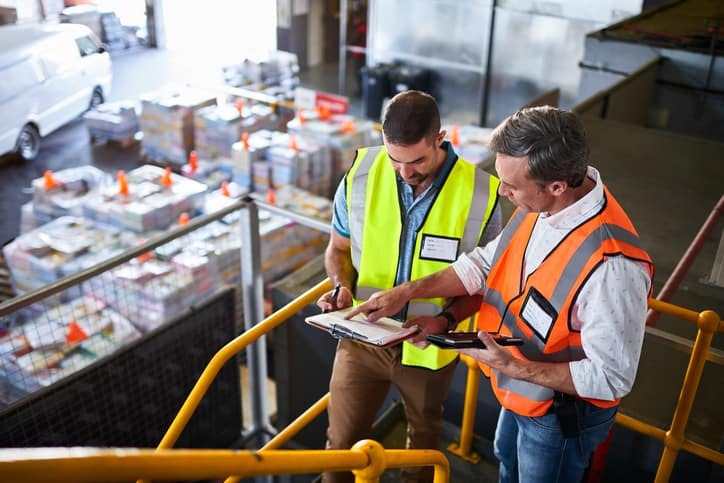 Recent statistics from the Bureau of Labor Statistics (BLS) show that in 2016, there was an average of 5 injury and illness cases per 100 full-time workers for the “Warehouse and Storing” industry. It’s not a surprise, given the environment – with all the heavy machinery and equipment constantly moving around. In fact, the dangers of the workplace even were mentioned in that classic NBC sitcom The Office. Hazardous materials in storage – Depending on the type of industry the warehouse is involved in, there’s a good chance that there may be hazardous materials stored in the area. If not properly maintained, cared for, supervised, and secured, these hazardous materials can leak, spill, or be otherwise released into the air with a high potential of injury to the workers on the floor and in the rest of the facility. Additionally, some of those hazardous materials can be flammable and improper use or storage could cause a fire. With the use of hazardous materials comes an extensive and detailed list of rules and regulations that must be followed. The best way to prevent any sort of accident with the materials is to study them and follow them to the letter. A good starting point for these would be this OSHA document dealing with the transportation of hazardous materials around a warehouse. Forklift incidents on the floor – It’s not hard to see where the danger from forklifts can come from – after all, a powered vehicle scooting around a warehouse floor, making sharp turns, with a pair of bladed “arms” sticking out in front of it is practically inviting some type of accident. As a matter of a fact, the statistics for forklift accidents are eye opening: according to OSHA, forklifts are involved in approximately 85 deaths and almost 35,000 serious injuries every year. This com article has more details on the dangers of forklifts: they weigh around 9,000 pounds, on average, and can zoom around at nearly 20mph. It’s essential that all forklift operators be property trained and certified, all the forklifts to be in proper working condition, and that the forklifts follow proper procedures when in use. OSHA has a guide to their use here. Slips and falls from surfaces – Slips, trips and falls account for a staggering 25% of injury claims across all industries in the country every year. For warehouse work which oftentimes includes narrow walkways, the potential for spilled substances and materials, and other hazardous pathways and areas there is a great danger for slips, trips, and falls to result in serious injury to life and limb. Again, the key to preventing this is proper maintenance and training. Educate workers about the danger areas, assure they have proper footwear, assure walkways and paths are clear of any potential disruptions, and be sure that equipment and materials that may prove to be a hazard are properly disposed of or put away in a timely manner. Take a look at this list of OSHA resources to familiarize yourself with this and other problems. Trip and fall from heights and falling objects from heights – A slip and fall from ground level is bad enough – but in many warehouses, materials may be stored at heights. Forklifts can be employed to retrieve many of those objects … but many more must be brought down or maintained by hand from workers, who must go up to those heights through some manner. Assure that workers if they need to go up to those heights have the proper training and safety equipment needed to perform their jobs effectively. Another height problem can come from objects stored at heights falling and causing injury. According to EHS Today with statistics from OSHA, there are over 50,000 “struck by falling objects” injuries in the country every year; with the amount of heavy, dangerous objects stored at great heights in the warehouse, there’s a great deal of injury danger if these objects manage to fall. It is vital that objects stored at height are properly secured and routinely checked to make sure they do not have the potential to fall. Joe Flanagan has over 14 years of experience in health and safety mainly as a Safety Engineer. He is currently the Operations Manager at Crowd Control Warehouse, America’s premier stanchion and barricade manufacturer. His aim is to improve overall safety and quality assessment in the manufacturing process. Nice article. Use of weaker or damaged pallets also threatens the safety of the workers. So, factors which are detrimental for the safety needs to be identified by conducting an inspection at a regular interval. Workers should be educated about the safety procedure to prevent any kind of accidents. The condition of different components of the pallet racking system should be inspected properly and abnormal components should be replaced with suitable substitutes. Safety comes first in everything and factors which are responsible to compromise the safety of the employee should be identified. The warehouse plays a crucial role in the productivity of the warehouse and any kind of accident not only threatens the safety of the employees but also affects the productivity of the supply chain. So, safety audit should be conducted after a certain time interval to identify and replace weaker components of the pallet racking system. Thanks for such an informative blog. Like it a lot. To prevent from accidents explosion proof camera, forklift camera and forklift speed limiter also help us.